June 11 briefing, this morning, is encouraging. When he talks about Falls Creek early on, that’s a group of houses up the road from us to the north situated in dense ponderosa forest. They’d done some great mitigation work around the homes there the past few years, and apparently it really helped the firefighters. 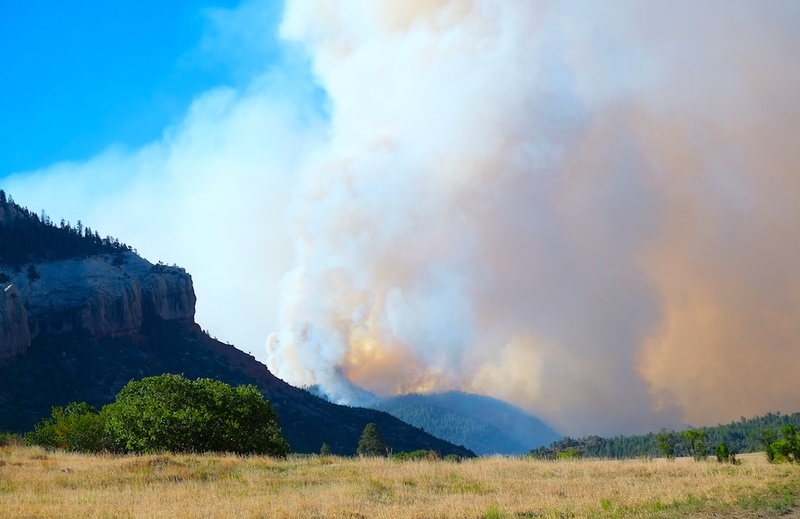 Down here, we’re mostly concerned with a spot fire starting in dry meadow grasses started by a wind-carried ember from the ponderosa forest at the top of the sandstone cliffs above and tothe north of us. We have well-watered green aspen close to our house. We’ve kept the Scrub Oak around our house a safe distance away, but three homes to our south are closely surrounded by dry oaks, and a fire down here will almost certainly take them out. While I was filling water buckets and placing them around the yard, attaching hoses to hose bibs, moving small propane tanks away from the house, etc., Debbie was weed whacking the dry grass around our big propane tank down to dirt. I feared running the tractor. Our biggest danger will be a big grass fire. But we’re defensible, we think, if the fire arrives here. Very concerned about some of our neighbors' homes. Well, there’s now a yellow ribbon tied around the 4x4 Post with the “English Setter Crossing” sign at the end our driveway signifying that a sherrif’s deputy has come by to let us know we need to be ready to evacuate. We were already getting things ready. Damn if the wind hasn’t come up again this afternoon, and another southerly run is likely tonight. We got the last thing we wanted to load up, our art, into our two SUVs this morning. We kissed goodbye when Debbie left for work to see some afternoon patients. She has a suitcase packed and in her car. Mine is loaded and ready to go. Film at eleven, as they say. Update: Debbie cancelled har last patient. We’re both home. “Durango Herald” wrote: Juliette Ambler led about 30 people in Buckley Park in five minutes of silence to pray and meditate for rain. 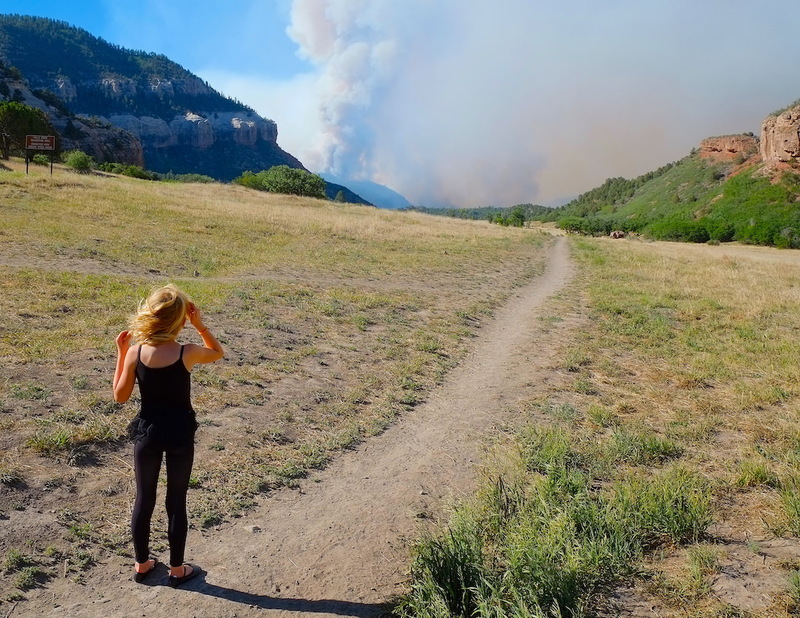 Katherine Reynolds, one of the rain-seekers, suggested everyone in Southwest Colorado focus their energy on thinking about rain twice a day at 4:16 a.m. and 4:16 p.m., based on the fire’s name. Good karma. Or mojo, perhaps? I'll tell you what my wife and I prayed for. For the current tropical waves and hurricanes near Baja or moving through Mexico to head on up there and dump all of the rain where needed, without causing any damage etc in their path. There's talk of a storm here in Texas for this weekend, and I wouldn't wish it on anybody, but there's lots of places that sure could use the showers. We're supposed to get rain from the remnants of that storm, "Bud," Sunday. 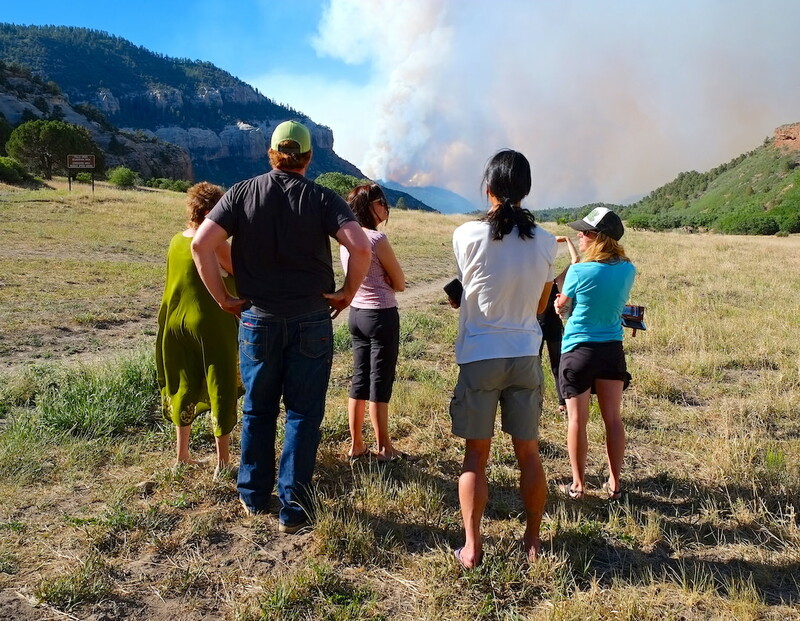 Yesterday, Debbie and I went up the valley a few hundred yards - to where the road up to Falls Creek is closed - to watch the fire with some neighbors. We live in a backwards "L" shaped valley called Hidden Valley. The bottom of the backwards "L" runs west to east, and the vertical line of the "L" runs north-south. 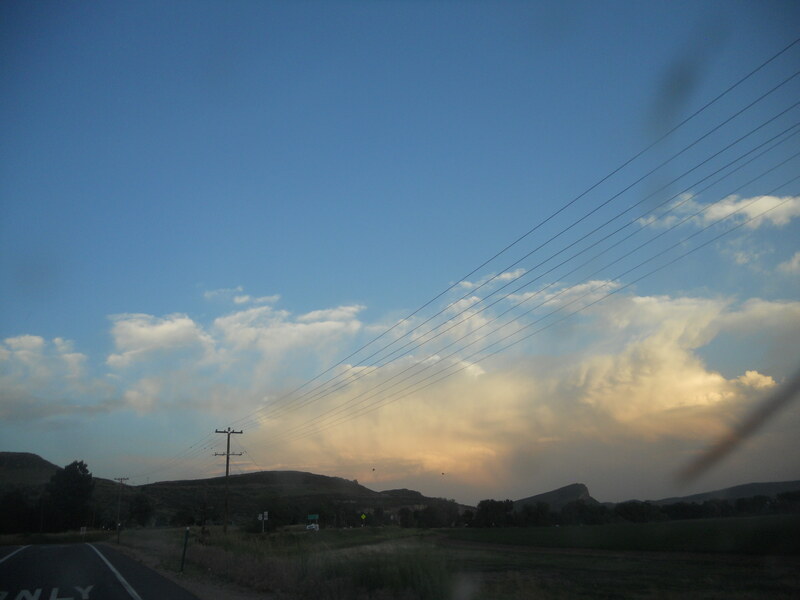 It's named for the fact that you can't see it from the town or the Animas Valley because from town to the south it's hidden by Animas Mountain, from the east its hidden by a fin of sandstone and to the west it sits beneath the eastern foothills of the LaPlata Mountains. The valley is 500' higher in elevation than the Animas River Valley below it. Where we're standing in the photos the elevation is around 7,000'. These photos were taken near the south end of the north-south part of the Valley where the road up to Falls creek (which has been evacuated) is closed. I don't know if this is a normal thing in the west, but our morning news spends a few minutes on fire updates each day. Of course the 416 fire is the biggest in the state but there are 5 or 6 others. I'm in the very northern part of CO and we could smell smoke here last night. 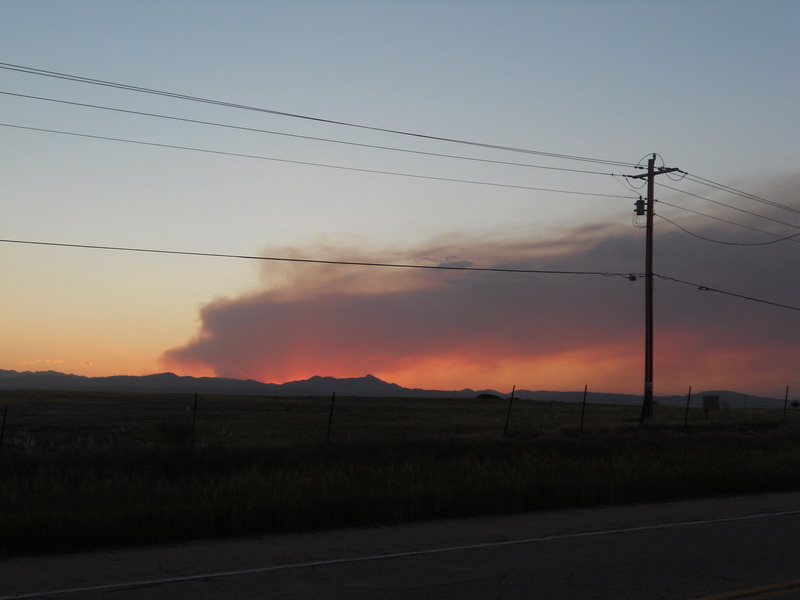 Officials said it's from the Badger Creek fire in the Medicine Bow National Forest just over the line in WY. It’s normal when the conditions are right. Fires are fairly normal, Fred. Catastrophic fires used to be far less frequent. This time of year there should still be enough snow on the mountains to ski, runoff should be peaking and it should be the greenest time of year. There's no snow up high. It's been pretty much gone for months. A lot of reasons given for the increase in catastrophic fires, all of them subject to debate, but among the reasons a long history of not letting small fires burn and a subsequent accumulation of fuel. But that policy changed years ago and controlled burns have taken place all over the western forests. There's no doubt that the current extraordinary drought has greatly exacerbated the normal fierceness of fire season. Last edited by durangopipe on Tue Jun 12, 2018 5:49 pm, edited 1 time in total. The fire is getting closer to us. I was told by a Forest Service guy that it is now burning in the Falls Creek Ranch subdivision, an area of fairly upscale homes in old Ponderosa forest. 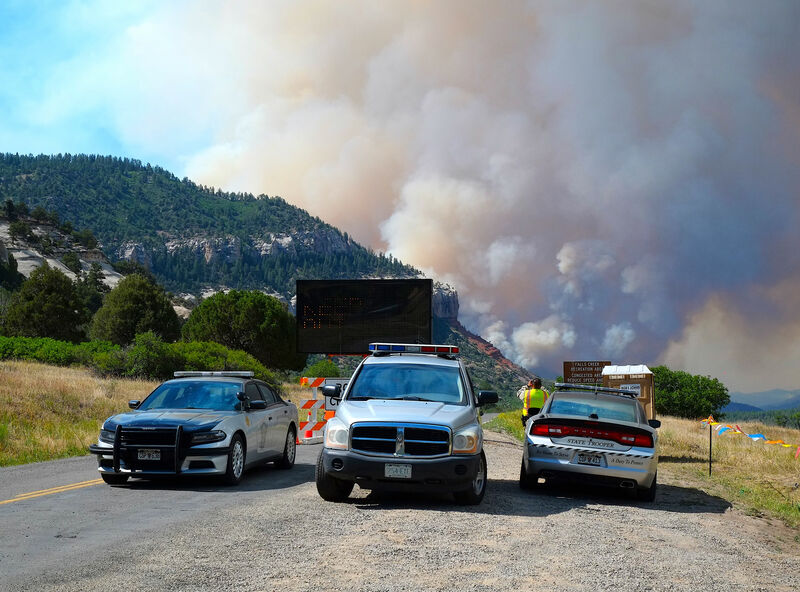 The Forest Service update this morning included the comment that the firefighters were seeing some of the best fire mitigation they'd ever experienced there, but this fire is a monster and I suspect that tomorrow we'll learn that homes have been lost. The fire is now closer to us and relentlessly moving this way. 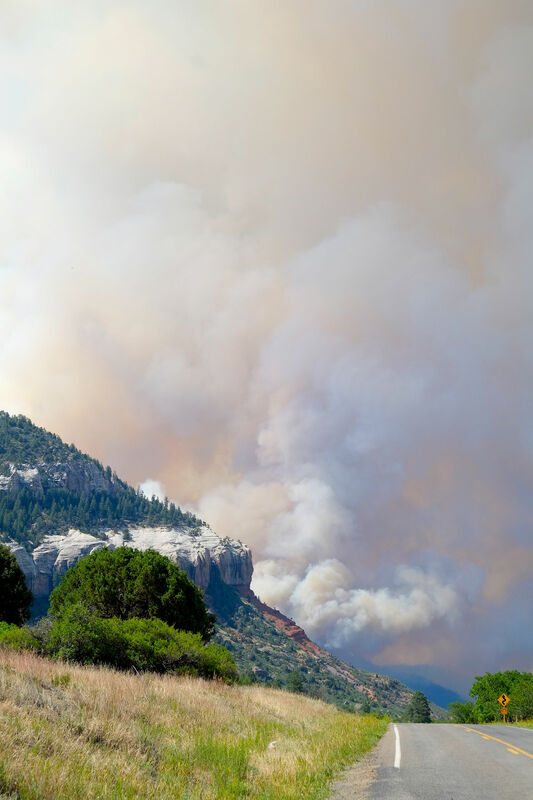 The spokesman for the Forest Service reported this morning that they are preparing to make a stand against the fire between us and Falls Creek, and CR 204 above us at the switchback at Animas Overlook then extend west hoping to force the fire into Hermosa Creek Wilderness. They fear if they cannot hold the fire on that line, it will enter town. Compare these photos with yesterday. Same place on the road, but not from out in the field because anything in the San Juan Forest is now closed - and the field is on Forest Service land. I see on WeatherUnderground over 2 inches of rain forecast for Durnago proper. I would imagine that could translate to much more rain in the higher elevations. This is really good news. But those nasty winds are still with you through tomorrow, Thursday. I also read that due to conditions in the Gulf Of Mexico, this years monsoon season is going to begin two weeks early, on June 15. Figure 4. 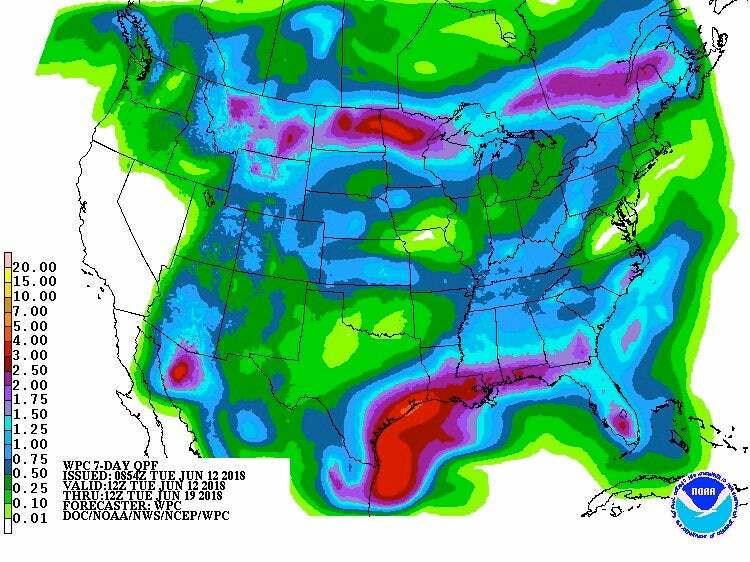 7-day precipitation forecast for the period from 12Z (8 am Tuesday) June 12 through June 19, 2018. Image credit: NOAA/NWS/WPC. If that happens it will be a huge help, Goose. Just hope it’s in time for us. We’re at the southern end where the fire is most active and advancing. Good news: still nobody hurt and no homes lost. That’s something of a miracle. Bad news: I’ve been monitoring several radio frequencies, one of them the one with requests for air support. A request was just put in for a VLAT (Very Large Aerial Tanker - the DC10) at our end of the fire. They were told it’s not available. Then the request was repeated as urgent. The dispatcher asked how many structures were at risk and the fire crew responded, “One hundred.” I think those are homes in Falls Creek. Not sure whether we’ll get the VLAT or not. May try to get a few more photos before we’re evacuated and the road into our valley is closed. Like a tornado in the Flint Hills and the blue tint in beetle killed pine, there's beauty in the bad. Fires make for pretty sunsets when they're not in your back yard. Looking south I can see smoke from the 416 and several other fires in CO. Looking northwest it's the Badger Creek fire in WY. Both pics from last night, 06/13/18. We are still home with our bags packed. I’m waiting for the Fire Managment Team to post the morning update, but we understand the fire went west yesterday. It was more humid last night and virtually windless. They are planning a “burnout” at the southern end to eliminate fuels and stop progression toward us and town. That’s supposed to create some pretty dramatic flame and smoke and our understanding is that we’ll be evacuated when that happens. But I’ll know more after the video is posted. If you guys up there can hang on for just a bit more forecast still shows rain coming in tomorrow, Friday and then a whole lot of rain on Saturday. 1 - 1/2 inches on Saturday in Durango proper, and I guess the higher elevations where there is fire would get substantially more? Praying that they get this fire under control and you need not evacuate. More, not sure how much more. But if we get that much it will really help. That’s the break the firefighters need.